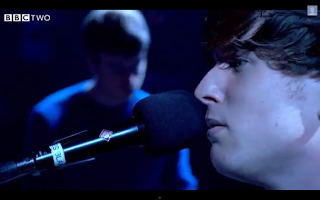 James Blake visited Jools Holland to play “Retrograde,” one of the best songs off his new album Overgrown. If you’re a James Blake super fan (and with that Chance The Rapper collaboration more and more people are) you’ll notice two cool things. One, the other fella on synths is Rob McAndrews aka Airhead, who put out a solid debut album this year with a near-perfect lead single. Two, Blake is wearing a 1-800-DINOSAUR shirt which is the name of his recently founded label. Watch the video below.